Mother Teresa passed into eternal life in 1997. Many people had the good fortune to meet her personally, (like Susan Conroy, pictured) but I never did. Or did I? In 1946 Our Lord called Mother Teresa from a happy and fruitful vocation with the Sisters of Loreto to take to the streets to serve the poorest of the poor. In just a few decades, there were thousands of her sisters all over the world. Staring at that map covered in thumbtacks, it struck me how each sister was, in a certain sense, another Mother Teresa — not just a fellow sister, not just a disciple, not just someone who wore the same habit, but someone who lived exactly like her. Not just taking care of the poor, but being one of them. Not just living as the poor do wherever they are in the world, but living as the poor of Calcutta do. Not just trusting God to provide for their needs, but never asking for money. The sister in charge of the house told me that Mother Teresa promised Jesus she would never say no to him. The fruit of that lifelong yes was love, enough to fill the whole world. I felt it when an Indian sister spontaneously threw her arms around my neck and exclaimed, “I want you to stay here forever!” It felt like the embrace of Jesus. In honor of the canonization of the humble saint who brought the embrace of Jesus to the world, Catholic Digest is pleased to bring you the personal testimony of people who knew her — the one and original Mother Teresa. Every afternoon, I volunteered in her Home for the Dying, where we took care of the sick and dying people we lifted up out of the gutters with our own hands. The work was very simple, humble, and basic. It involved bathing each patient, cleaning his or her bed, dispensing medicine, feeding those who could no longer feed themselves, and holding those who could no longer be fed. Mother Teresa wanted us to have “a joyful willingness to do even the most humble work” for the poor and dying. While I was sitting there holding this gentleman’s body, praying for his soul, and crying, who came in the door but Mother Teresa! She came right to my side and helped me. She helped me to close his eyes and fold his hands and take care of him. 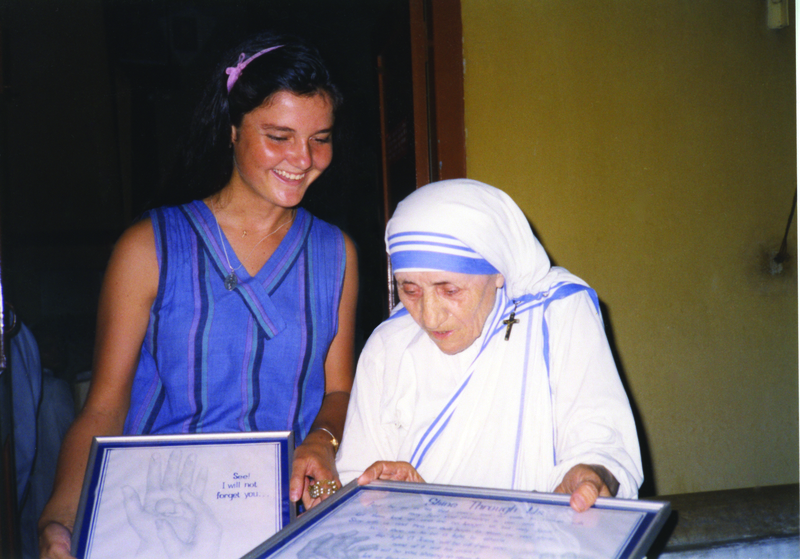 During my first summer in India, Mother Teresa surprised me by asking for a special favor. She wanted me to draw a picture of a little child in the palm of God’s hands. While I was a seminarian at St. Peter’s Seminary in Bangalore, India, our rector introduced me to Mother Teresa, who was looking for a place to start her ministry among the poor. I showed her a slum where the poor lived below the poverty line. She asked for a place where the poorest of the poor live. When I took her to such a place, she said she would send two sisters of her congregation who would live among these poor in a hut without running water or electricity; they would have to sleep on the floor; they would need to earn their food daily by working hard like their neighbors. If they didn’t work, they would have no food. It is important, however, she continued, that they spend at least one hour in prayer. Jesus in the Blessed Sacrament is important for our life; hence she asked me to provide the sisters with daily holy Communion. Some years later, while I was a professor in the same seminary, there was an effort from Rome through my bishop to make me a bishop. Inspired by Mother Teresa, I chose to serve the poor rather than being a bishop. At present, I am running a trust in order to help widows and poor girls to improve their lives in various ways. I met Mother Teresa in 1986 when she came to start a house in Baton Rouge, Louisiana, as well as a number of times in the early 1990s in Rome when I was a seminarian and then a young priest. I also heard her speak two or three times at various events. I experienced a feeling of being very small in the presence of that tiny woman. I felt like I was in the presence of God. I felt at that moment that I was the most important person in the world to her and that should Jesus walk in at that moment of our encounter, he would not have received a greater attentiveness. I think this is the trademark of the contemplative, being “in the present moment” — and the trademark of her deep faith, recognizing Jesus in his distressing disguise in every person she met. She saw Jesus in every person thirsting, and like Mary at the foot of the cross, she tried to do all in her power to satiate that thirst with her love. Mother Teresa did not have her head up in some lofty cloud of saintliness. Her feet were firmly planted on the ground, and she was very much aware of the realities of the day. She preached that we are all called to be saints. She strove for holiness within the nitty-gritty details of everyday life as she served all she met. Everyone was Jesus to her, whether it was the person she picked up out of the gutter and pulled maggots from; the baby she retrieved from the dustbin; St. John Paul II, with whom she was very close; or me, a simple suburban housewife. Everyone deeply mattered. She teaches us to do the same. It was incredibly edifying to watch Mother Teresa take care of others (and me too!) with great reverence for the Jesus she believed lived within each one of us. She was not only my friend, but my spiritual mother, too. She helped me through some very trying challenges, which I detail in my memoir, The Kiss of Jesus: How Mother Teresa and the Saints Helped Me to Discover the Beauty of the Cross. Mother Teresa draws us to the feet of Jesus. Her life was a living testament of his love. On more than one occasion when discussing apostolates and our spiritual journeys, Mother Teresa told me that I should “be the one.” She explained, “Jesus said, ‘I looked for one to comfort me, but found none.’ Be that one to comfort him, through your prayers and good works.” Her message speaks to us all. This article originally appeared in Catholic Digest in August 2016. Now read my interview with the Little Sisters of the Poor.